Three TTC subway train cabs. Detailed driver cab including multiple computer screens, fire extinguisher, emergency spill blankets, master controller handle, circuit breaker panel, poseable sun visors, adjustable driver chair, coffee holders, bypass control panel and door control panel. Exterior detail such as staff door access panel, train run number display, destination display, poseable windshield wipers, exterior handicapped accessible lights, door open lights, train emergency lights, operator occupancy lights, headlights and running lights. Articulating and extendable front end coupler for emergency pushing of disabled trains. Four sets of doors per train car each with slide opening doors for passenger boarding. Twenty sliding doors in total. Two cab doors for the operator to enter from track level or one cab door from inside the train. Handicapped accessible seating and raised floor pieces to aid vision impaired passengers. Lift off the roof on all three sections for easy access and play. Emergency detrain device or EDD. In the event of an emergency, passengers or operators may be required to evacuate at the front or rear of the train rather than on the side doors. High voltage electricity collectors on each regular wheel assembly which makes a direct connection to the "third rail" supplying power to the train. Underbody trip switches to stop trains in the event of an emergency. Overhead handrail system for passengers who are standing including the pull-down handles. One complete section of "third rail". One Signal Tree with a trip arm. 12 Pieces of Straight Track. 16 Pieces of Curved Track. When I first started working on the subway I was amazed by the number of people that posed for "selfies" with the train, train enthusiasts taking pictures, and watching children on the platforms and overpasses wave to me as I drive the train. Seeing this attention from the public for the first time I came to understand how much of icon the TTC and the Toronto Rocket was in Toronto. I originally began to design this set as a display model for myself as an adult collector. When I talked about my concept with my friends at work, many asked if I could also make additional copies of the set when I was finished. So with that in mind, the project quickly evolved from a simple display model into a fully functioning playset with all the detail I could think of. I also visited my local LEGO store at Yorkdale Mall to browse LEGO City sets and train sets on display. 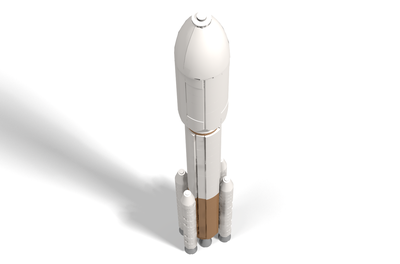 When I showed my initial designs for the Toronto Rocket to the staff and customers currently in the store the response was overwhelmingly excited. The amazing staff there informed me how many local and visiting LEGO fans come in all the time looking for sets that are “Toronto” themed and they thought the Toronto Rocket set would be a huge hit. I began to see that the popularity of a LEGO set such as the Toronto Rocket reaches much farther than just to the local Toronto population. 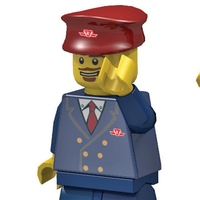 There are train enthusiasts around the world who love to collect memorabilia such as this and I believe that with the TTC just being awarded the 2017 APTA Transit System of the Year is just one more reason this is the perfect time for this set to be released to the whole LEGO fan base. Upon showing my completed set design for the Toronto Rocket set to the management at the TTC, I received a full endorsement to submit my Toronto Rocket Set Design to LEGO Ideas, with a promise to help spread the word about the voting via social media to the 13,000+ TTC employees and hundreds of thousands of daily TTC customers. This is my first attempt at a custom designed LEGO set. I have been a collector of Lego for my whole life. I currently have over 300 Sets (mostly Star Wars and Classic Space) and 900+ Minifigs consisting of over 11,000 pieces. So naturally, I decided to buy a LEGO CITY Subway set to add to my collection and I was saddened to realize there is no such set. The closest set I was able to find was the 60051 Passenger Train set. It was then when I started to research the idea of creating my own set and in Feb 2018 I began this long process. The current train design I have on display here is as close to possible to the real train as I could get with the pieces available in the Lego Digital Designer Software. The reason for such a high piece count is a lot of the smaller pieces were needed to get the more accurate design and details. 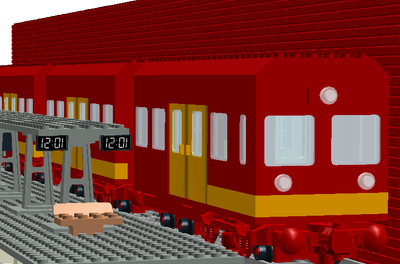 Over 1150 assorted variations of 1x1, 1x2 or 1x3 plates/tiles, and over 450 variations of 1x1 or 1x2 standard bricks accounts for over half of the entire train design. This set has two "A" cars which are the operator control engines and one "B/C" car which is a passenger only car. While the original Toronto Rocket subway train has four door sets per side on each train car, this is not feasible on a model of this scale so I was forced to include only two sets of doors per side, per car with two windows in between. The first car is "A" car was the original concept of my design and has the most detail and play options. This car is easily identifiable as it has by the blue pivoting connectors that attach the train wheel assembly to the body. The middle car is a "B/C" car. On the full sized Toronto Rocket train, the cars in middle are known as “B” or "C" cars. The differences between these cars are invisible to the general public and are only differentiated by presence equipment required for train operation. This "B/C" car is easily identified by the red pivoting connectors that attach the train wheel assembly to the body. The second "A" car which has been altered to include a "POWER FUNCTIONS" motorized power unit for remote control play. This car has a reduced amount of internal detail in the passenger area to make room for the battery and receiver. This car is easily identifiable by the green pivoting connectors that attach the train wheel assembly to the body.